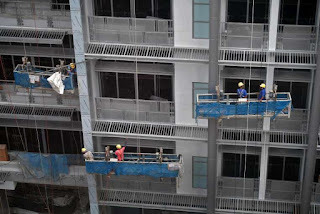 SINGAPORE - Enforcement efforts at work sites had been stepped up by the Ministry of Manpower (MOM) in June, with more than 400 safety violations uncovered, said Minister of State for Manpower Sam Tan on Monday (July 17). This update comes after a structure at a Pan-Island Expressway (PIE) work site collapsed last Friday and killed one worker. Speaking at a Workplace Safety and Health (WSH) forum, Mr Tan said inspections were done at 400 sites targeting work-at-height activities and these netted more than 400 safety violations. Of these, the authorities meted out 322 notices of non-compliance, 70 composition fines and four stop-work orders. Three of the four stop-work orders were given due to work-at-height safety infractions, said Mr Tan. "We will take strict and serious action for each safety violation and impose severe penalties. These violations could have been injurious or harmful to the workers," he said in Mandarin. Last Friday morning, a 40m segment of a viaduct at a PIE work site collapsed, killing one worker and injuring 10 others when the corbels holding up the horizontal beams that they were on gave way, according to preliminary findings. Said Mr Tan on Monday: "The accident has shocked many and I am also deeply saddened by it. The Ministry of Manpower (MOM) and relevant authorities have commenced an investigation into the cause, and issued a stop-work order. "The investigation is still ongoing, but the worker who was killed can't be brought back to life. We must make sure that safety comes first." Mr Tan was speaking to about 90 participants - mainly bosses from construction firms - at the WSH forum, which was conducted in Mandarin at the Devan Nair Institute for Employment and Employability. Organised by the WSH Council, the lunchtime forum is the first one to reach out to Mandarin-speaking senior management of small- and medium-sized enterprises (SMEs) in the construction industry to educate them on the importance of safety for work at heights. Falls from height were responsible for most deaths at workplaces last year. This was one of three priority areas under this year's Programme-based Engagement Plus programme, which aims to raise WSH competencies and awareness by engaging the industries involved. There were 13 fall from height incidents last year, compared to 24 in 2009. 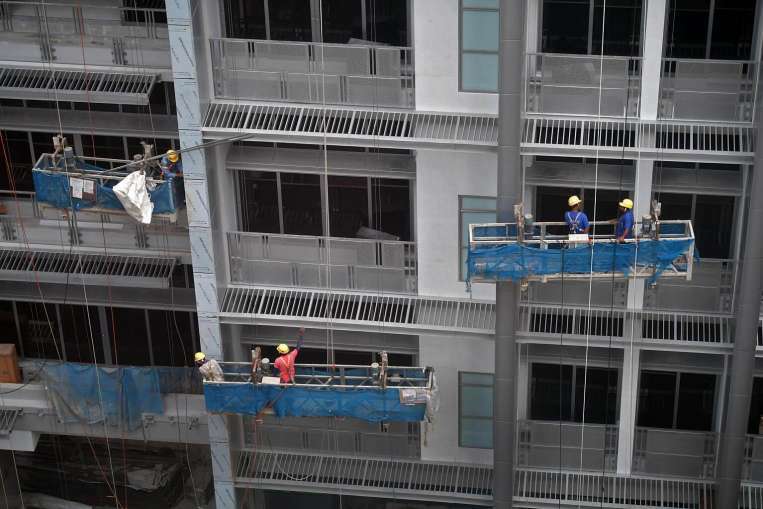 Within the construction sector, six workers were killed last year after falling from heights. The other two priority areas under the programme are accidents leading to amputations and traffic accidents. Mr Tan on Monday also highlighted the importance of work at heights safety and how falls-related workplace incidents can be prevented. He reiterated some of the initiatives rolled out to educate and guide companies in adopting safe work-at-heights practices, such as the expansion of the Mobile Work at Heights Programme in which MOM visits work sites to share tips on safe work practices. There were 80 such visits when the programme launched last year. Mr Tan said the goal this year is to increase that to 300, in order to benefit more small- and medium-sized construction enterprises.